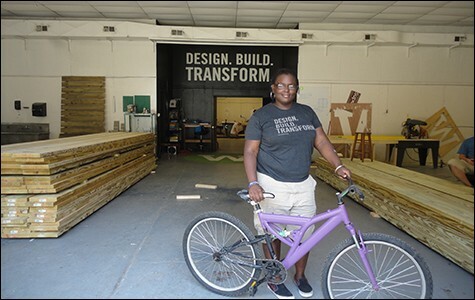 If You Build It shows how design changes the lives of students such as Jamesha Thompson, who built this bike. Directed by Patrick Creadon. Opens Friday. Matt Miller and Emily Pilloton, the two main subjects of the thought-provoking feel-good documentary If You Build It, characterize the high-school students they are teaching industrial design to as full of the "raw talent and creativity and brilliance of youth," but nevertheless believe that "it gets drained out of them systematically." Notes Miller, "They have only seen things decline." Indeed, Bertie County, North Carolina, where architecture and design professionals Pilloton and Miller choose to focus their foundation grant public-service efforts, is the poorest county in the state when they arrive there in the fall of 2010. In the bedraggled, often-flooded town of Windsor, the two most exciting new businesses are a four-employee cottonseed oil company and a Domino's Pizza. But Pilloton, a UC Berkeley graduate and former product designer, and Miller, a socially committed architect, welder, and fabricator from Michigan, see promise in the young people of the "hollowed-out small town." 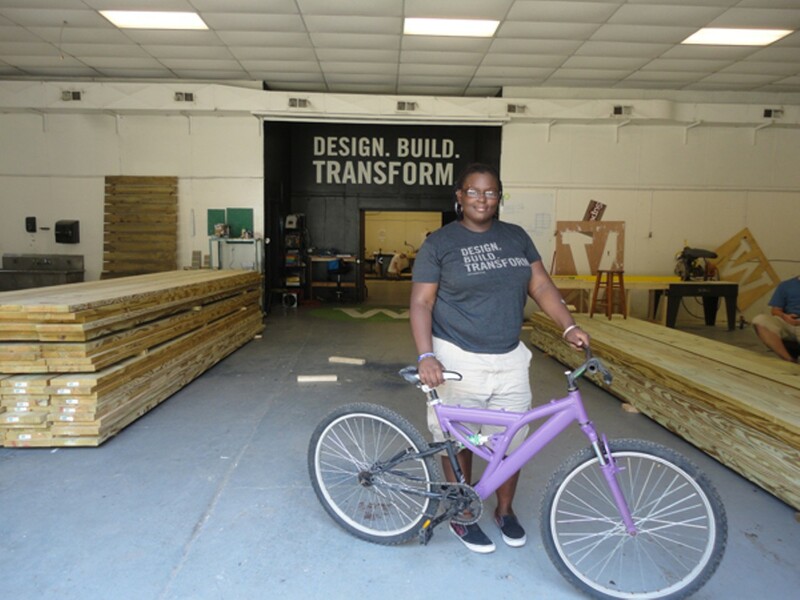 They approach the conservative school district and get permission to launch Studio H, a one-year extracurricular program to teach selected students advanced wood and metal shop, with real-world planning applied to designs the kids choose — and an emphasis on critical thinking and hard work. Says Miller: "Academia is too clean. There's something about getting your hands dirty." "We basically run a design studio for sixteen-year-olds," says Pilloton. Director Patrick Creadon's doc follows the two designer/activists and their students through a three-tiered course of study in which they first construct a beanbag game board, then a chicken coop, and then a serious public structure, a farmers' market for the town of Windsor. The film has the usual tough-love, Coach Carter-style touches. Kids who are used to coasting through school are challenged to think for themselves and produce something useful. It takes a little coaxing, but they catch on. Not everyone can be a designer, says Pilloton, but the idea is to give creativity a structure. The students "figure out how to put it out in the world and make it real." And presumably, their training will remain with them as they build a life in Bertie County. The experiment is not without its clouds, however. The school board reluctantly approves the operation of Studio H but withholds any funding, leaving Pilloton and Miller to cover the gap between their grant money and their salaries. As the year goes on they pay themselves nothing and use the grant money for materials. Pilloton particularly comes across to the locals as the consummate outsider, for three reasons: She's a woman, she's half Asian, and she's from California. In the film, Miller is still smarting from his experience in Detroit, where he designed and built a house, awarded it to a low-income family for a rent cheaper than they were paying before, and then got burnt for the rent. When he went to investigate he found the house abandoned and trashed. Those problems melt away once the farmers' market is built, even though Windsor didn't pay a dime for it, nor for the students' on-the-job training. Pilloton eventually took her Studio H concept back to Berkeley, where she now runs Project H Design — which stands for Humanity, Habitats, Health, and Happiness — as well as Studio G, a summer camp for girls. Meanwhile, Miller conducts a public school design-build course in Carbondale, Colorado. "The vision, the process of Studio H can be done anywhere," says Pilloton in voiceover. Certainly it makes an impact on Kerron, Cameron, Stevie, Jamesha, Rodecoe, and the rest of the Bertie County kids, whose prospects before they met the know-it-all Yankees seemed pretty limited. If You Build It earns its heart-warmth honestly. As we watch the kids at work we can actually witness social progress taking place. The truest tribute of all is paid by one of the students, who thanks the two do-gooders for making him think. "They brought everybody up," he says. You'll be happy you saw this film. If You Build It is not showing in any theaters in the area.